After spending some time over the last week toying around with the Hover Camera Passport, a new ultra-portable self-piloting camera drone that can automatically trail your movement, I've discovered two things: It's outrageously fun to play with, and it has most definitively put the selfie stick out of a job. But more importantly, it's an exciting glimpse at what could very well be the newest and coolest trend in travel photography. 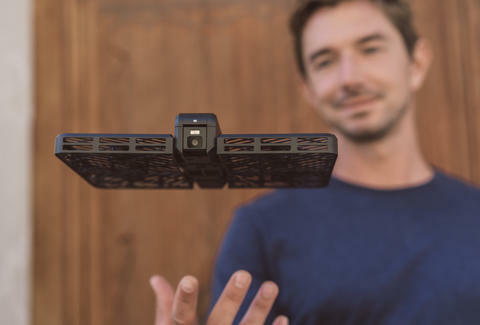 Unlike most recreational camera drones I've tried, Hover is incredibly easy to control. Unfold it, tap the power button, fire up the smartphone app, and you're piloting via virtual joystick on the screen. Using a combination of downward-facing sonar and AI, it simply floats in position wherever you place it. What's more, it doesn't erratically zig-zag and clip passersby with its sharp blades when you inadvertently over-exert the controls in one direction or another. Instead, its four propellers are safely encased in a carbon-fiber cage, and it gently moves up, down, and 360 degrees around on command, snapping 13MP photos and near-4K video at the tap of a finger. Hover's coolest feature by far, though, is its auto-follow modes. Once it's in the air, you can lock the camera onto you or another person's face or body and it will automatically follow you. Like a magically floating GoPro, it keeps your face or body focused in the camera frame the entire time, keeping pace even if you're speeding along on a bike. If you want, you can also engage the orbit mode, which will shoot a 360-degree wraparound video of you, even if you're moving. At $550, it's a pricey selfie-snapping accessory, but considering the thing is roughly the size of a Kindle, it makes the most sense as a travel companion since it can capture vistas and memories from jet-setting adventures around the world in a way even the best smartphone cameras cannot. Bottom line, once you've spent some time with it, you're going to want your own. Joe McGauley is a senior writer for Thrillist and a recently discovered drone nerd.